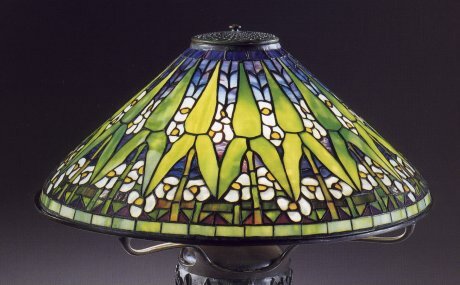 Sotheby's April 1995 auction for the collection of John Mecom Jr.
the sharply conical shade with an allover pattern of upright spatulate arrowroot leafage in striated and lightly mottled lime-green, grass-green and olive-green glass tiles flanked by two rows of arrowroot blossoms with mottled opalescent petals and lemon-yellow centers, reserved against a ground in deppest purple striated with sea blue and sky blue; fitting onto a ring support above a standard well cast in medium relief with upright cattails, the expanding foot well cast with overlapping lily pads, rich green-brown patina, has finial, shade impressed TIFFANY STUDIOS NEW YORK, base impressed TIFFANY/STUDIOS/NEW YORK 29717/11. Height 24", diameter 20 1/2". © 1995, Sotheby's, all rights reserved.